Cutting-edge Lower East Side art and photography brings a blast from the past and a force for the future. Reportedly not for the weak of heart or those who are easily scared. Artists: Lincoln Anderson, Anne Apparu, Nico Dios, Cheryl Dunn, Charles Gatewood, Kevin Harris, Troy Harris, Steven Hirsch, Curt Hoppe, LA II, Leslie Lowe, Pete Missing, Angel Orensanz, Jerry Pagane, Clayton Patterson, Elsa Rensaa, Q. Sakamaki, Shell Sheddy, Suzannah B. Troy. 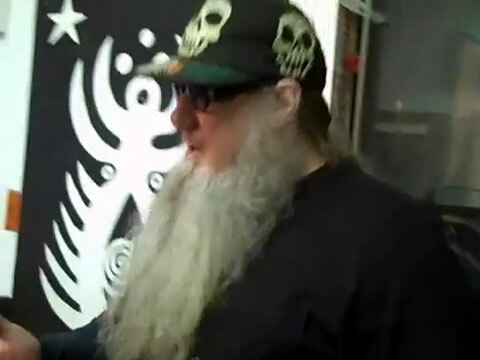 Screenings: Captured; Dirty Old Town Patterson will answer questions about his archives of photos, videos, and books documenting life in the LES. 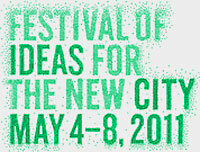 The Festival of Ideas for the New City, May 4-8, 2011, is a major new collaborative initiative in New York involving scores of Downtown organizations, from universities to arts institutions and community groups, working together to effect change. A first for New York, the Festival will harness the power of the creative community to imagine the future city and explore the ideas destined to shape it. It will take place in multiple venues Downtown and is organized around three central programs: a conference of symposia; an innovative StreetFest along the Bowery; and over one hundred independent projects and public events. The Festival will serve as a platform for artists, writers, architects, engineers, designers, urban farmers, planners, and thought leaders to exchange ideas, propose solutions, and invite the public to participate. A conference of symposia, lectures, and workshops with visionaries and leaders— including exemplary mayors, forecasters, architects, artists, economists, and technology experts—addressing the Festival themes: The Heterogeneous City; The Networked City; The Reconfigured City; and The Sustainable City. Events take place at The Cooper Union, New York University, and the New Museum, Wednesday to Saturday, May 4-7. An innovative, minimal-waste, outdoor StreetFest takes place along the Bowery. 100+ local grassroots organizations and small businesses present model products and practices in a unique outdoor environment. Saturday, May 7, 11 a.m to 7 p.m.
100+ independent projects, events, performances, and walking tours that expand on the Festival’s themes, open at multiple venues Downtown, activating a broad geographic area. Projects are listed in chronological order and most events are free. New American Cinema Group, Inc.